At the behest of King Louis XII of France, who was coming under increasing pressure from the forces of Henry VIII, France was drawn into a new war with England. 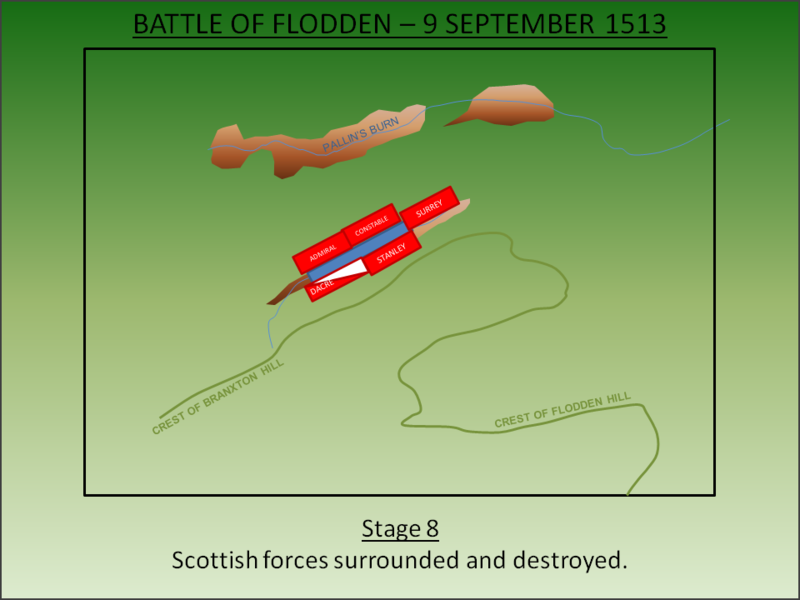 Fulfilling his commitments under the ‘auld alliance’, James IV of Scotland invaded northern England but was defeated and killed at the Battle of Flodden (1513). Henry VIII became King of England in 1509 and sought to re-establish his nation’s position on the continental stage after decades of intermittent internal conflict that we now call the Wars of the Roses. Henry joined Pope Julius II's Holy League against France in 1511 with the tantalising prospect of recovering Aquitaine for England. Whilst the campaign was a failure, King Louis XII of France responded to the English position by resurrecting the ‘auld alliance’ with Scotland. He implored James IV of Scotland to invade northern England to distract Henry’s efforts on the continent. James IV, having been King since 1488, had been an effective monarch who had brought peace and growing prosperity to Scotland. He had forged a fledgling Scottish Navy and was married to Henry’s sister, Margaret Tudor. But he was also faithful to his treaty commitments so this successful and peace-loving King reluctantly took to arms and crossed into England with a huge army – some accounts suggest up to 60,000 men. The King immediately attacked Norham Castle, the formidable border fortress, that guarded the eastern most ford over the River Tweed. His artillery bombardment reduced the castle to such an extent that the damage to the Great Tower is still visible to this day. 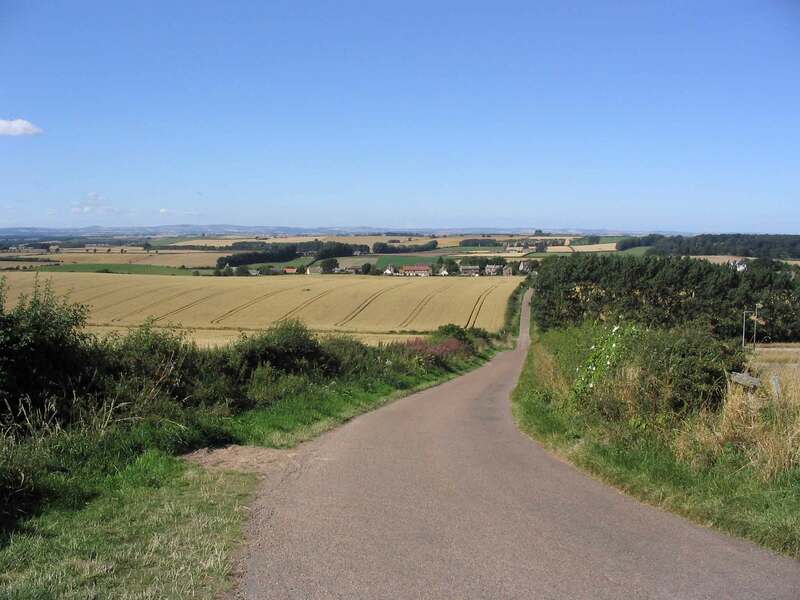 The secondary line of English defences - Chillingham, Etal and Ford - all fell to the Scots in rapid succession as James sought to draw English troops away from France. Henry VIII however had left Thomas Howard, Earl of Surrey in the north to deal with any Scottish invasion. A veteran military commander whose battle honours included fighting at Bosworth Field, he raised a northern army which mustered at Alnwick Castle. 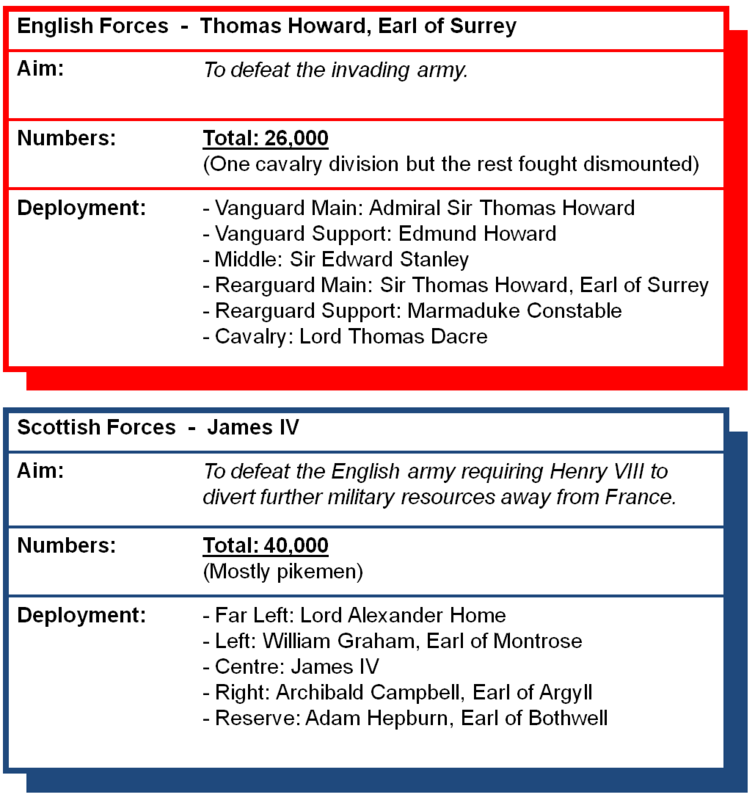 In a throwback to the medieval era, Surrey issued a challenge to the Scottish King to fight a pitched battle no later than the 9 September 1513. 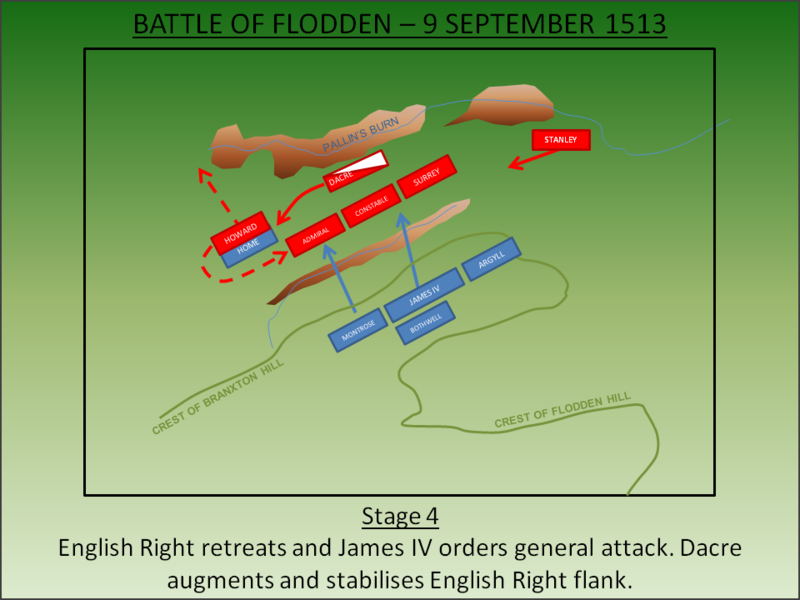 James accepted and moved to occupy the superb defensive position at Flodden Edge. Surrey arrived at the scene on the 7 September to find James in an unassailable position with artillery in place atop a high hill. A request from Surrey for the Scots to move to a fairer spot was unsurprisingly rejected - James noted he would ‘take and keep his ground at his own pleasure’. Surrey now calculated his best opportunity was to flank around and attack the Scots from the north. He moved around the captured Etal and Ford castles and arrived at the village of Branxton. He now blocked any Scottish retreat back north and had by-passed the dug-in artillery. The Scottish army deployed on Branxton Hill was around 40,000 men strong and armed with the latest continental weapon - the 16 foot long pike - a weapon designed to be used in a tightly packed formation that maintained forward momentum. This had been introduced into the Scottish army by their French allies. The English force numbered circa-26,000 and was armed with the bill. The army was formed into six Divisions – one cavalry force under Lord Dacre and five of infantry with one under Surrey himself and another under his son, Admiral Thomas Howard. The battle was fought on 9 September 1513 in light rain and with a strong wind blowing in the faces of the English. 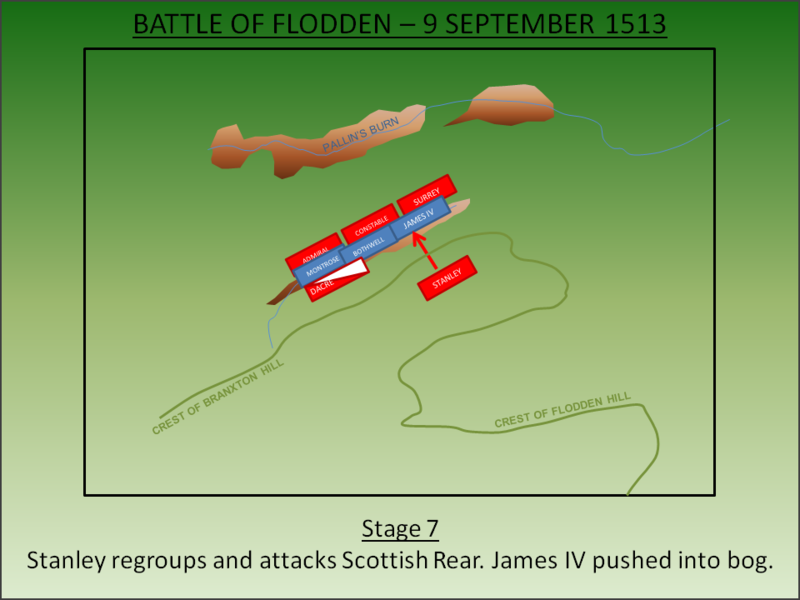 James had witnessed the English manoeuvres from his vantage point at Flodden Edge but was unsure of their intentions – he suspected it might be an attempt to attack Scotland to coax him into withdrawal. By the morning of the 9 September however the intention was clear – his force was being attacked from the rear. He now found himself on the ‘wrong’ part of the high ground with a plateau to his back which would aid the English attack. He mobilised his army and reformed them a mile to the north at Branxton Hill overlooking the village. As the English approached, the marshy ground of the Pattins Burn bottlenecked their approach. The Scots could have attacked at this time but James intended to fight a defensive battle and was doubtless also confident that the larger size of his army gave him the advantage. Nevertheless the battle started when four of the five English infantry formations were in position. The fighting began around mid-afternoon with an exchange of artillery fire. 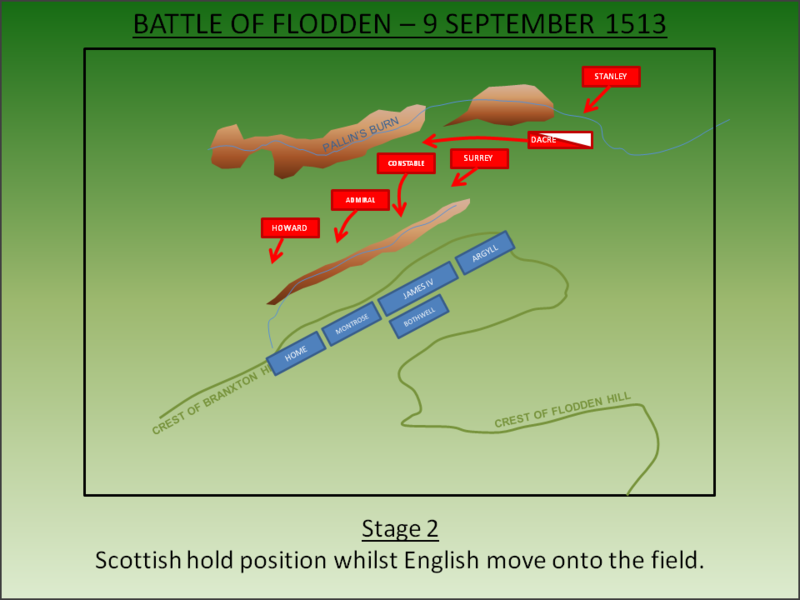 The Scots seem to have had the greater number of artillery pieces, all hastily re-located from their previously strong prepared positions on Flodden Edge, but it was the English bombardment that seemed to have the greater effect. Under the pressure of effective gunfire, the forces on the Scottish left under Lord Home, decided attack was the better option and charged against the English right. The weight of Home's charge was successful with the inexperienced Cheshire forces of Edward Howard breaking. Some stood their ground and fought on but when Sir Brian Tunstall was killed and Edmund Howard wounded, they too fled. Home's division could now have won the battle by attacking the flank of Admiral Howard but instead the Scottish troops, which were drawn from the borders, turned to plunder and looting instead. They paid with their lives as the English cavalry under Lord Dacre, held in reserve, counter attacked driving the Scots back. On the ridge James was in a dilemma. He had planned to hold the ridge and fight a defensive battle but, having seen the initial success of the unauthorised Home charge and mistakenly believing some of their forces had attacked the exposed flank of Admiral Howard, he now anticipated an English rout. Accordingly he ordered his remaining Divisions to advance against the English lines. The assault of the Scottish pikes, an extremely effective weapon when used by a moving force, sent the English line into a general retreat. 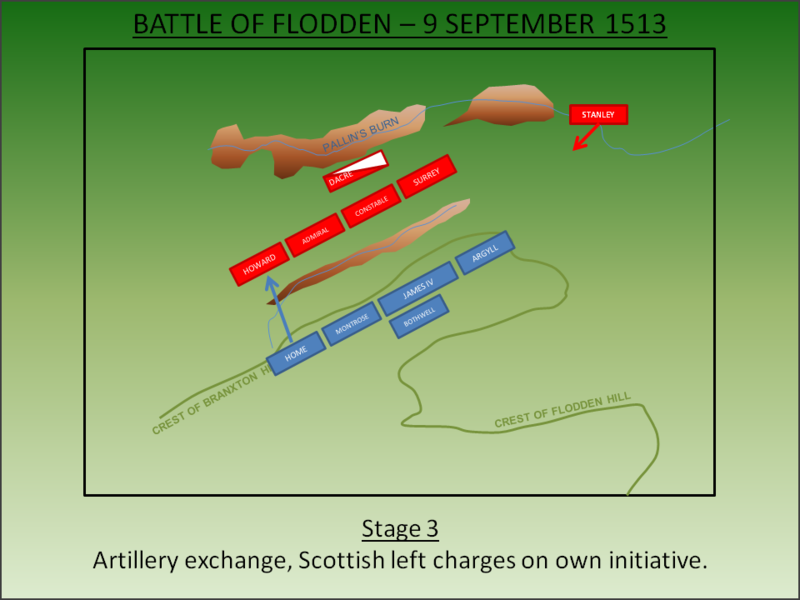 After losing some ground, effective leadership resulted in the English line being stabilised and the Scots advance was held. With momentum lost the situation now became critical for the Scottish as their main weapon, the pike, was now ineffectual. James requested support from his reserve, under the Earl of Bothwell, who advanced on the centre in support of the King. Concurrently the Scottish right, which consisted of the Argyll Highlanders, had remained in position on top of Branxton Hill. They had been waiting for the final English Division, under Lord Stanley, to establish itself in position. They continued to hold as Stanley seemingly launched a frontal, uphill assault against them. But it was merely a feint; the greater part of his force had flanked them and scaled Branxton Hill. They launched a devastating archery attack followed by a charge against the Argyll Highlanders who broke and fled the field. 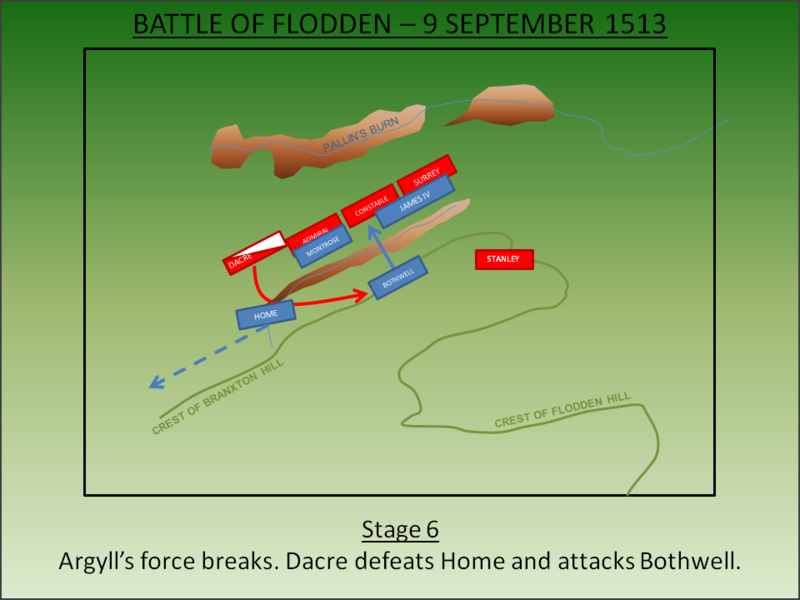 On the English right, Dacre had neutralised the threat from Home's force, who were now in retreat, and launched an attack on Bothwell’s flank whose forces collapsed. Both Dacre and Stanley were now able to bring their forces into action against the Scottish rear effectively surrounding the King. The battle was now a disaster for the Scots. Desperately reverting to their secondary weapons – the sword and axe – they found even these were no match for the English bill. The Scots were pushed downhill into the boggy ground where they were cut down. King James fought on and died with his army; this great Scottish King was to be no prisoner. Although an extremely famous battle and a decisive Scottish defeat in which many Scottish nobles perished, it achieved little. Henry’s campaign on the continent came to nothing whilst there would be further wars with Scotland later in his reign which perhaps fuelled English political opinion on the benefits of uniting the two Kingdoms. Ninety years after Flodden, the crowns of Scotland and England were unified. Cauldwell, D.H (1998). Scotland's Wars and Warriors: Winning against the Odds. Historic Scotland, Edinburgh. Chandler, D (1998). A Guide to the Battlefields of Europe. Wordsworth, London. Douglas, D.C and Williams, C.H (ed) (1975). English Historical Documents Vol 5 (1485-1558). Routledge, London. English Heritage (1995). 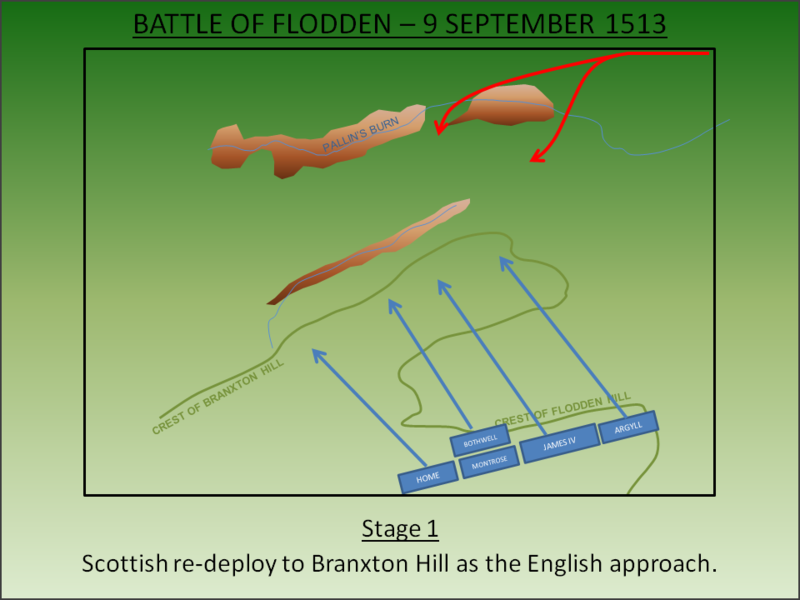 Battlefield Report: Battle of Flodden (1513). List entry: 1000011. Lancaster, J.H.D (2014). 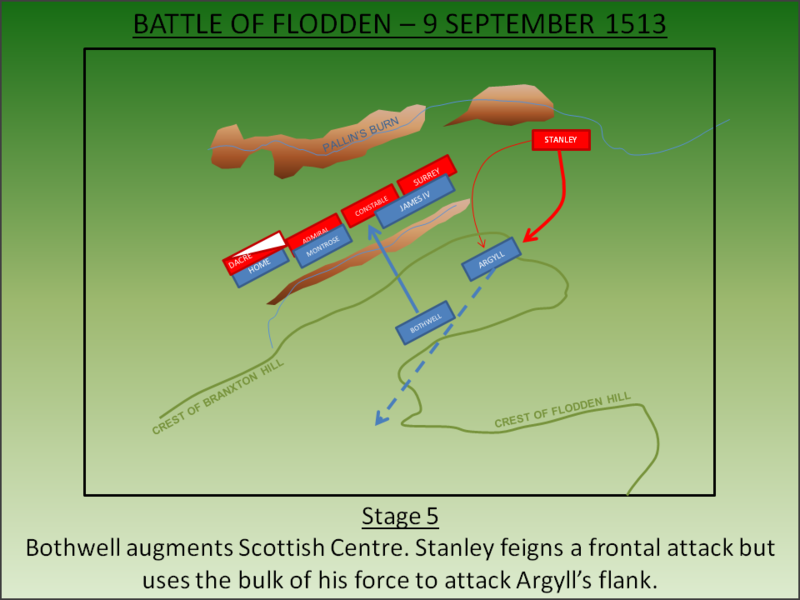 Flodden: Battlefield visit notes and observations. CastlesFortsBattles.co.uk. Mackenzie, W. M. (1913). The Battle of Bannockburn. A study in mediaeval warfare. Grant and Murray, Edinburgh. Marix Evans, M (1998). The Military Heritage of Britain and Ireland. Andre Deutsch, London. Ordnance Survey (2015). Northumberland. 1:1250. Southampton. Phillips, G (1999). The Anglo-Scots Wars 1513-1550: A Military History. Boydell Press, Woodbridge. Ridpath, G (1776). The Border History of England and Scotland. T Cadell, London. Robson, J (1897). Border Battles and Battlefields. J.H.Rutherford, Kelso. 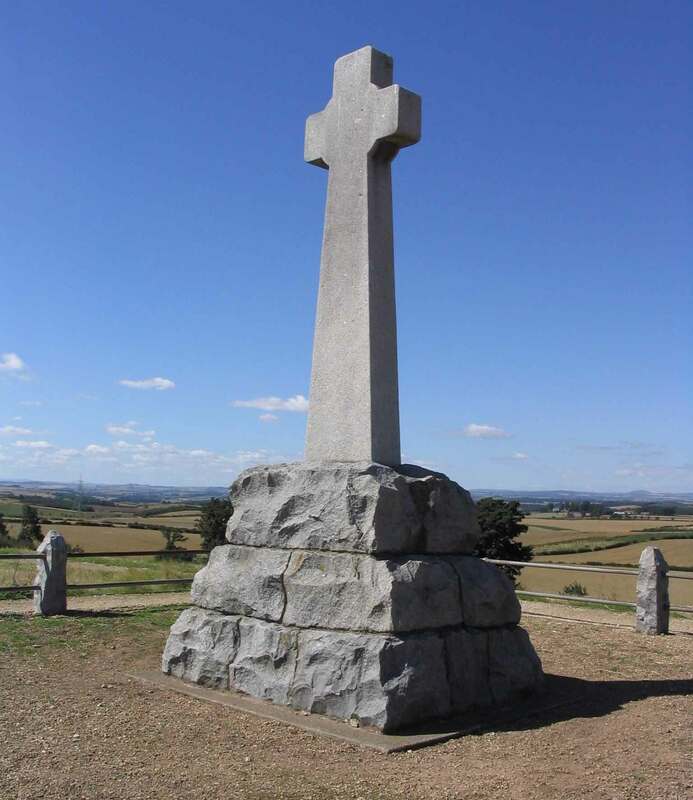 A monument marks the site of the English starting position and gives a good vantage point of the battlefield which remains largely undeveloped. A visit in Winter after heavy rain will give a good idea of the terrain at the time of the battle! A battlefield trail takes you to the dip of the hill - scene of the rout - and onto the Scottish starting lines. Battlefield. 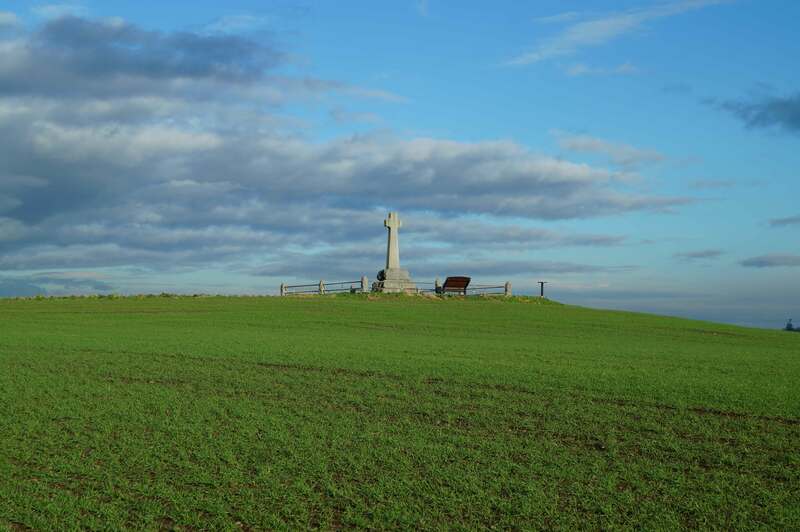 Looking towards the English lines - the monument was just to the rear of the English starting position. Battlefield. 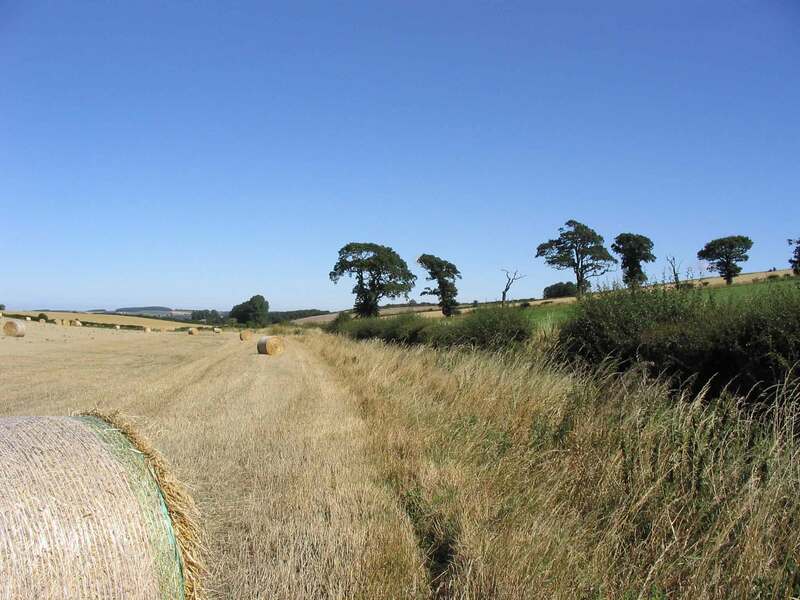 View towards the Scottish starting position from the English lines. Monument. Positioned towards the English Right flank, the site of the monument gives a good view of the battlefield. The Killing Ground. Although well drained today, this dip between the two hills was a bog in 1513 defusing the Scottish charge. Armed with long pikes, the Scots had relied on keeping both momentum and formation as they attacked the English - the bog threw them into disorder. Found near the small village of Branxton off the A697 the battlefield is sign-posted and has a dedicated car park for visitors.Sturdy footwear is recommended!